Trivandrum Rising - Our city tomorrow and how we can help it develop. : Is there a Strategy in the room?! Is there a Strategy in the room?! I had the occasion of attending the CII organised conference - IT in Kerala - Challenges and Opportunities - at the Taj Residency yesterday. It brought together eminent speakers like Mrs. Neela Gangadharan - Chief Secretary, Kerala, Mr. Shibulal - COO, Infosys, Dr. Ajay Kumar - IT Secretary, Kerala, Mr. R. Anand - Senior Partner, Ernst & Young, Mr. Vijayaraghavan - the first CEO of Technopark, K.N. Balagopal - Political Secretary to the CM and Mr. V.K. Mathews - Chairman and CEO of IBS. As the name of the conference suggested, its purpose was to identify some of the reasons why Kerala is still relatively an IT laggard in South India and some of the focus areas through which we can catch up with the likes of Karnataka and Andhra Pradesh. Its other purpose was to act as a curtain-raiser of the mega-event that the CII proposes to conduct in Trivandrum in December 2009 to promote investment in the IT/ITES sector in Trivandrum, along the lines of Connect, held annually in Chennai. The Chief Secretary laid out the ambitious plans the Government has been articulating over the last two years, of attracting over Rs 10,000 Crores of investment in the IT sector through the PPP mode. About Rs 6000 Crores of this total is expected to come into Technocity along. Mrs Gangadharan also mentioned the current "hub-and-spoke" strategy which the Government is following, that has now gone to the level of trying to disperse the industry right down to the panchayath level with 200 "small IT parks"!! At this rate, we will be tripping over IT parks all over the place. I guess the question of how all these parks are going to get used in a State which accounts for a little less than 1% of the IT/ITES industry in India even when Karnataka which accounts for nearly 50% has just embarked on developing its tier-II IT parks is a question which has escaped the policy makers. More on that later. 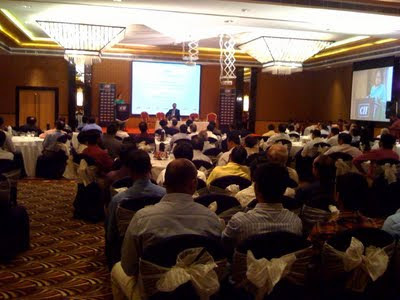 IT experts like Mr. Mathews, Mr. Shibulal and Mr. Anand agreed upon the fact that Kerala possesses a lot of strategic advantages in terms of its cost advantage, physical infrastructure and the volume of human resources available but is tied down by the investor perception, lack of a viable approval mechanism and by the relative lack of "finishing" of its graduates. Mr. Shibulal went on to focus on the need to improve the soft skills of our graduates while lauding the numbers of technically skilled graduates being churned out by our higher education system - an impressive 5% of the national total, from less than 3% of the national population. Mr. Anand focused on the need to demonstrate a successful case of developing infrastructure which will help promote word-of-mouth opinion among investors. The Infosys COO also believed that it would be critical to stop the exodus of skilled manpower from Kerala by providing them with a top-class portfolio of professional opportunities as well as social infrastructure comparable to the metros. Most of the speakers agreed on this aspect of infrastructure to turn Kerala from a net exporter of human resources to a net importer, such as Karnataka. Mr. Vijayaraghavan also called attention to the fact that almost 95% of the IT infrastructure in Kerala has been developed by the Government while it is the other way round in Bangalore or Chennai. To improve the quality of the available human resource pool through a combination of finishing courses and upgradation in the school and college curricula. Many of these points echo what TDF talked about in our suggestion for a new paradigm in Kerala's IT infrastructure strategy which was submitted to Sri Balagopal a couple of weeks ago. Especially elements like a strong umbrella brand, PPP in infrastructure development, creating a vibrant IT ecosystem and the development of IT-based integrated townships. Focusing on Technopark and at most on the other major parks - Infopark and the Cyber Park, where Binu Pazhoor has just taken over as CEO - rather than all over the place would be a wiser strategy. Real PPP projects like Technopark expansion, Technocity and the expansion of Infopark/Cyberpark should receive top priority rather than being bothered about any old thing that the media cares to trumpet about. The official Government stance was still the much talked about "hubs and spokes" strategy. Mr. V.K. Mathews raised the point that Kerala could be jumping the gun by moving ahead with the spokes before a strong hub is built up which can attract major international players. The reply was that the spokes would be built-up, and if they cannot attract investors, then they would be allowed to go into hibernation till demand picks up. A good way of testing the market, but quite expensive considering a few hundred crores of public money would be needed for this "experiment"! The other worrying part is that the official line about why Kerala has failed to attract investment in comparison to Karnataka or Tamilnadu is that investors were not willing to look outside the metros till date. Partly true, but that does not explain the success that other tier-II cities like Jaipur, Nagpur and Coimbatore have managed to attract major players like Ascendas, Mahindra, IBM and DLF even though their IT presence is much smaller than that of Trivandrum. Covering up for almost non-existent marketing and an inglorious track record of partnership with the private sector is not the best way forward at all. All the speakers agreed that the next two to three years would be crucial if Kerala is to catch up with the rest of India's leading IT states or at least to stay at the top of the next bunch of IT destinations. No doubts about that. We hope that instead of the direction-less wandering of the last few years, the voices in the room are heard by the powers-that-be and a clear strategy is worked out and implemented. Otherwise, there may be a lot more of these seminars and more post-mortem analyzes happening over the next few years! Setting the Dance Floor on Fire!